Nuria is 34 years old and lives in the province of Barcelona. In April 2007 eight words changed her life: Acute myeloid leukaemia with inversions in chromosome 16. At that time she was 30 years old and had gotten married to her boyfriend Toni six months earlier. She was working as a Clinical Psychologist in a hospital and enjoyed her work a lot. Although she thought that she would never be able to have children due to the chemotherapy sessions she had to go through, today she is the mother of Marti, who is 19 months old, and she is waiting for her second child, whose name will be Guillem. 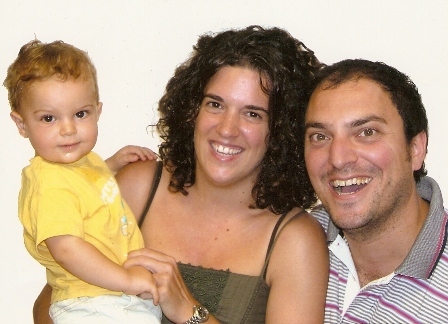 Núria, with her husband Toni and Martí. In 2007 you were diagnosed with acute leukaemia. How was your personal situation in that moment? I had gotten married to Toni the 9th of June of 2007. We'd just moved into a new flat and I was working as a clinical psychologist in the "Hospital de Terrassa". That was my personal situation before being diagnosed as having Leukaemia. I used to spend my time enjoying my job, my husband and my friends. I was an amateur five-a-side soccer player. We didn't have much success in terms of football, but it was great satisfaction just being part of an extraordinary group of women. What were your plans for the future? Were you considering having children? One of my plans was to keep on working in order to improve my professional career. I was the coordinator of the "Unidad de Juego Patológico" of the "Hospital de Terrassa", and I was involved in a scientific investigation among other projects. In addition to that, I wanted to enjoy my personal life with my husband and my environment. Having children wasn't an immediate priority for me, although it was definitely a medium-term plan. So you started your chemotherapy treatment immediately. What happened later? What was the treatment like? After my first admission and my first chemotherapy session, the leukaemia went into remission. This was followed by two more hospital visits which lead to a complete remission. I didn't need a bone narrow transplant. The treatment consisted of intravenously administering chemotherapy. This leaves you without white blood cells and affects your immune system. At that point the risk of infection was very high. That's why the periods in hospital were long (3 to 4 weeks) and extreme control measures were adopted to avoid infections. Were you informed at any point that the treatment you were receiving might produce side-effects and might cause infertility? What was your reaction to this news? And your husband's? Did you talk about it with your doctors from the beginning? I can't remember whether the doctors told me about it while they were asking me a lot of questions and explaining everything about the disease and the treatment the first day of my admission, or it was me who asked them about the infertility and the existence of possible side-effects. What I can remember is that I asked them to postpone the chemotherapy treatment in order to save some of my ovules. The doctor advised me not to do so because the priority was to start the chemotherapy treatment, and the operation to save ovules required the treatment to be delayed by 15 days at least. Due to the emotional block that the diagnostic had caused, I wasn't too worried about the possibility of not being able to have children in the future. It was clear to us what the highest priority was in that moment and we both accepted that adoption could be a solution. I started feeling a bit sad about the possibility of not being able to have children when I left the hospital and I was completely recovered from the leukaemia. Although it was clear to me that we'd done the right thing, I was upset with the disease and the general situation. But little by little, I came to accept the situation, and the fact that I should feel lucky about my recovery. There were different options to have children. During your admission, were there any psycho-oncologists on the wards? Were there any social workers or psychologists? Did they help you in any way? And your family, your husband and your friends, how did they support you? Everyone supported me from the beginning. Toni was the person who helped me the most. He stayed by my side the whole time. Sometimes, he would even make me forget about the disease, the admissions and the isolation that the treatment implied. Furthermore, since he is a doctor, he knew how to be there by my side the whole time. Apart from him, I should say that my family, especially my mother, Toni's family, and all our friends were close to us every single day. They were able to understand and respect that sometimes the best way to help us was not visiting us or staying at the door in order to avoid the risk of infections. During those months I felt like I had been surrounded by all the great people in my life. There was a psycho-oncologist in the team at the "Hospital Duran i Reynals". I didn't need any professional help, but he was close to me as he was my friend and we both had the same profession. The rest of the health personnel from the hospital were able to provide me the medical and emotional support I needed in every single moment too. Once you overcame the illness was it a surprise that became pregnant? Yes, eight months after leaving the hospital I got pregnant. We hadn't taken any measures. We just tried to enjoy our daily lives as much as possible. We tried not to worry too much about the possibility of not being able to have children. We'd decided to postpone it, and to try adoption as a possible solution later. Due to this, it came as an unbelievable surprise, as we'd almost accepted that we would find it pretty difficult to have children. Now that you have a pretty child and another one coming, what would like to you say to a woman that has been diagnosed with leukaemia? Firstly, I would say that the most important thing this is to recover. If you don't do so, you won't be able to have children for sure. If you recover, you will be able to achieve anything you want. I don't think that being obsessed about the infertility is a good way to face the process that the recovery involves. Once you have recovered, it might be the case that you can't get pregnant, but this doesn't mean that you can't have children. Now that my son Marti is nineteen months old I can say that the best thing about having children is not just giving birth, but the chance to enjoy them every day and to see how they grow. Learn more about possible infertility in haematological malignancy patients. Read more patient and ex-patient testimonies.